In this, the third volume of collected Free Content Friday, you will be able to enjoy all of what was offered throughout the year in a newly revised and edited format! Brilliant new settings including the depths of an Undercity, the Open Road and Caravans, and a Marina Stronghold, all of which are now available to you and your players. There is also the mini campaign as part of “Things That Go Crash In the Night III” where players can battle a host of modern takes on Greek mythology and monsters. There are things for all players new and old, for those just starting Outbreak: Undead.. campaigns or dedicated fans who want an easily referenced compilation of all of the past year’s editions of Free Content Friday. 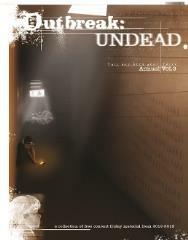 Enjoy, fans of Outbreak: Undead, both new and old!